Simon Hart: Free Not For Resale MSDN Subscription up for grabs!! 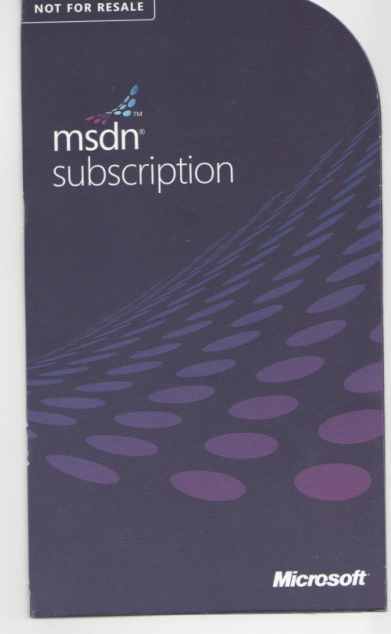 Free Not For Resale MSDN Subscription up for grabs!! I have in my possession a Not For Resale Visual Studio 2010 Ultimate with MSDN Subscription, and it's up for grabs. Like all other Microsoft MVPs I had 3 to give away, I have given away 2 already but now I have just 1 left. So I can't think who to give it to as the two lucky people that received this free subscription were the only ones that I know of who wanted to get into programming or wanted to move to Visual Studio 2010 and the 2010 wave of Microsoft products. Most of the people I know receive Visual Studio 2010 as part of their corporate MSDN licence provided by the company they work for. As I am passionate about Technical Architecture and good clean code and the fact I have done lots of code reviews in my career, I thought the challenge could be around best coding practice or the best example of clean maintainable easy to understand code. So the challenge is really: write an application for the new Windows Phone 7 Series device using the new free tools (Visual Studio 2010 Express with Windows Phone 7 Series) that promotes good architectural design. So..... the ultimate question you're probably asking is, what application should you write? well it doesn't matter. It could be an application as simple as a calculator to something that makes use of networking or Windows Azure for example. The person that wins this will be win it based on good architecture code design. You've got until Tue 26th November to get something to me to review. Then I'll announce the winner before the end of November. The subscription does expire soon which is why I'm only giving about 3-4 weeks to do this. Send submissions to simon (at) simonrhart (dot) com. If you have any questions then leave a comment on this post. Come on people!! don't be shy, so far I have 0 submissions..
do you still have this license? I am looking exactly for this as an ambitioned amateur software developer using vb.net, c# and f#. Why should I give it to you?